Wouldn’t it make sense for schools to teach things young people actually should learn, like how to take care of their hair? That’s a real, practical skill that could benefit them on a daily basis. However, alas, it does not seem to be much of a priority. Since schools won’t teach hair care, here are some tips regarding hair mistakes to avoid. Skip the at-home hair color and get it colored by a professional instead. Why? Well, most people tend to pick the wrong shade for their skin tone, or miss important spots. Avoid cutting your own bangs. Why? 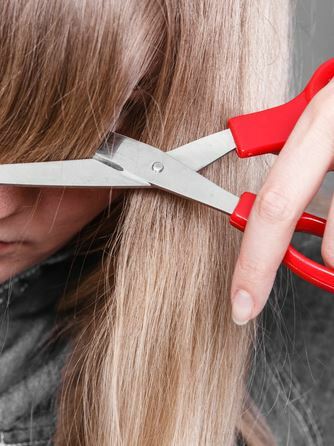 Did you know you should cut hair vertically rather than horizontally? Yet people who cut their bangs typically do it horizontally. Furthermore, they often take too much off. Don’t overwash your hair. Washing your hair too often could strip it of essential oils. If you’ve got heat styling tools, please don’t use them on wet hair. When you do, you’re scorching your follicles. For towel-drying hair, be gentle. When you’re rough with a towel you can damage your strands. Furthermore, you’re scrubbing off leave-in conditioners. Microfiber is good to use to dry hair, rather than towels that look and feel like sandpaper! When you use conditioner, by the way, you don’t need to cover your entire scalp because that produces a tacky film build-up. Instead, focus on applying the conditioner to just the ends of your hair. Conditioner helps hydrate hair– you don’t want to overdo it. If you use a blow dryer/heat dryer, never leave it on one spot too long or else you risk frying your hair– essentially burning it. Move the dryer around so it still dries the hair but doesn’t fry it. Even though you may think you don’t need to get a haircut (or a trim) and you’re letting your hair grow long, it’s important to nonetheless see a professional more often than not. If you don’t, you’re going to develop bad split ends. Talk with your stylist about how often he or she thinks you should be getting your hair done. Finally, did you know cotton dries your hair out? So if you’re sleeping on a cotton pillowcase at night, try replacing that with a silk one instead. You can also wear a hair bonnet designed to maintain your hair’s moisture and volume if you so choose. If you’re frustrated by a loss of hair, contact NM Hair Replacement Studio of Manhattan to see how they can help.